The free Series 65 practice test will assist you in passing the Series 65 exam, which is a test that is used to assess the test-taker’s knowledge and ability to perform adequately as an investment advisor. The Series 65 exam is composed of 140 multiple-choice questions that cover four content areas. These content areas are as follows: Economic Factors and Business Information; Investment Vehicle Characteristics; Client Investment Recommendations and Strategies; as well as Laws, Regulations, and Guidelines, including Prohibition on Unethical Business Practices. The Series 65 practice test will address the same content. The exam should take three hours to complete. 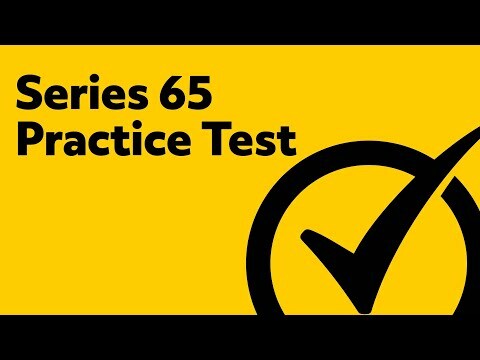 This page focuses on the Series 65 Practice Test. The Series 65 Exam is a challenging test that test the minimum requirements for an Investment Advisor to perform the functions of the job. This three hour test, which includes one hundred and forty questions (including ten example questions), is designed to validate and assure that each advisor can perform all the minimum basic requirements and functions of an Investment Advisor. It is extremely critical to have working knowledge and experience of the terms and definitions associated with the questions on the Series 65 Exam. Due to the cost, detail and amount of information covered in the test, it is important to study and prepare for the Series 65 as early and as much as possible. The Series 65 Study Guide provided by Mometrix, as well as the Series 65 Flashcards, are specifically designed to help you obtain the very best test score possible. The passing score is a 72, which means you need to get 94 questions correct. What Does the Series 65 Test Cover? What is the Series 65 Exam? The North American Securities Administration Association (NASAA) was organized in 1919, making it the oldest international organization devoted to protecting investors in the stock market. The Series 65 is just one of the tests administered by the NASAA to ensure that all Investment Advisors have obtained enough minimal knowledge to give solid investment recommendations to their clients. The Series 65 license allows Investment Advisors to be able to charge a fee for their services, if they feel it necessary to do so, although it is used as an option when it is ethical and a benefit to the client. The Series 65 Exam is a way for NASAA to ensure that Investment Advisors is knowledgeable in economic and business cycles, as well as, the type of investment vehicle or vehicles that is appropriate for that client. The test also covers many methods and strategies that can be implemented to ensure that the most beneficial investment plans are being offered to the client. The candidate does not need a sponser like the Series 7. Each time you sit for the test, the fee is $165.00. If you do not pass (72%), there is a 30- day cooling off period for the first two attempts. The waiting period to take the test the third time is 180 days. The Series 65 practice test, which mimics the actual Series 65 exam, covers in-depth analysis and knowledge that is required to become an Investment Advisor. The first area of content covered has 19 questions associated with general business flow. The importance of how to look at a company or business to see if it is financially stable to invest in and comparing it to other benchmark companies. A background in finance and statistics is very helpful in understanding these concepts. If you do not have this background to pull from, not to worry, the Mometrix Practice Test will also get you familiar with these concepts. Business cycles during economic trends and how to recognize them. Monetary and fiscal policy and how it effects businesses. The value of the US dollar and how inflation/ deflation effects its fluctuation. How interest rates and yield curves relate to economic indicators, such as, the Gross Domestic Product (GDP), employment indicators, trade deficit, Consumer Price Index (CPI). How to decipher the important information from Business Financial Reporting, Statements, Ratios, SEC Filings, Annual Reports and prospectuses and how it effects your decision as an Investment Advisor to place or withdraw clients from investing. Understand the basics of Quantitative methods, statistics, derivatives, price to earnings and how they all effect each business you are recommending as an investment. Systematic verses unsystematic risk and how to explain the differences to the client. Know how opportunity cost and capital structure effects the timing of investments. Cash and cash equivalents – CDs, money markets, treasury bills and commercial paper. Types of Equity Securities – common, preferred, restricted, foreign and convertible stocks, warrants, ADRs, employee stock options and shareholder rights. The analysis of stocks and mutual funds, the difference between open and closed end, unit investment trusts, real estate investment trusts (REITs), determining the net asset value and the discount/ premium of each. Know how to determine performance of an investment, how to weigh it, annualize it and calculate the after tax or expected return/ yield for the client compared to the market benchmarks. The final section of the test asks 40 questions regarding laws, regulations, guidelines and prohibition of unethical business practices. Be aware of the State and Federal Laws that regulate Investment Advisors and the post-registration and registration requirements. Conflicts of interest, excessive trading, loans to and from clients, sharing profits, confidentiality, insider trading, selling away and market manipulation. As you can see, the Series 65 Examination covers a very broad, extensive, amount of information. It is a lot of information to retain, making it necessary to implement plenty of study time with your Mometrix Practice Test and Flash cards. This is an opportunity to excel in your career and promote your knowledge and skills to your peers. A client will feel more comfortable trusting you with their finances knowing that you have succeeded in passing the Series 65 Exam. Start studying early and get the best score possible the first time. Mometrix Academy is a completely free Series 65 study material resource provided by Mometrix Test Preparation. If you find benefit from our efforts here, check out our premium quality Series 65 study guide to take your studying to the next level. 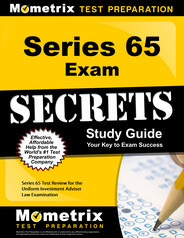 Just click the Series 65 study guide link below. Your purchase also helps us make even more great, free Series 65 exam prep content for test-takers. Our customers love the tutorial videos from Mometrix Academy that we have incorporated into our Series 65 test study guide. The Series 65 study guide reviews below are examples of customer experiences. Awesome product. I was nervous about the volume of information I would have to learn for the Series 65 Exam. I wanted to focus on the most relevant material so I could maximize my study time. The Series 65 Exam Secrets Study Guide allowed me to zero in on the materials I needed to learn giving me much relief that I wasn’t focusing on less important material. The additional bonus items also were a great help allowing me to know ahead of time what to expect and be prepared for the test with as little anxiety as could be possible. I’m happy to report I passed and am on my way to huge profits with my new job. Thanks Mometrix. You’ve given me a HUGE boost to my career. I just received this book and Just started but i can tell a difference from others I’ve read years ago. This one is precise, to the point & easier to comprehend. Lots of good test pointers. Will give other reviews when the big day come! After using another study guide, I appreciate that this is a comprehensive and “to the point” guide. The competition study guides are 4 times as thick and throw everything at you including the sink. This study guide is geared to understanding the terms and provides test questions w/ a detailed explanation of the answers. The best part of this program is the 5 Secret Keys, General Strategies, How to overcome test anxiety and study steps & helpful techniques. Personally, I found this to be the most important feature and benefit since it has been a while since I’ve taken a test of this caliber. The details on how to take this test while reducing anxiety sets Mometrix Test Preparation apart from the competition. I really appreciate how slim and sleek the book is; the weight of the book is very manageable when carrying it throughout the day for designated study times. The feel and color textures of the cover give off a good feel for what’s inside. I find the content of the material to be rather comprehensive. I love how the book gets right to the point, offers study tips, and truncates the information – only to include the most pertinent information for the exam. The book does not consist of the traditional 600- 700 pages, which make this book easy to read and digest. The material within the book is presented in plain language and is accompanied by examples that provide easy enough information to understand and retain. I want to share that the material in the study guide is very easy to understand. I find other programs hard to follow. The book version allows me to learn on the go. This material breaks down the information in very much everyday terms, it allows you to see how an event or action affects your clients, and from a fudiciary point of view, how we as Registered Investment Advisors might react, to an event. The material put everything into perspective. I have shared this to other team members so they, too, can learn the material. The information is well organized and helps to highlight key concepts one would need to know. It’s also a nice supplement to my other resources offering a healthy, straightforward “change of voice” to my prep.